I really recommend this property to stay if Portland is very busy, by the way it's located close to a very nice neighbourhood that features some good restaurants. We really enjoyed our stay at The Benson, and will definitely look to stay at this hotel again the next time we're in Portland. The location of this motel is excellent for visitors heading north from Portland as it is on the north side of the city. The staff were very friendly, Ashley at the front desk was more than happy to map us out some places of interest and great places to eat as we had never been to Portland. Madison at the front desk made us feel so taken care of during our girls trip to Portland for four days! This is a fun property with an old fashioned radio, and a phone that appeared to be the same. We were on the eighth floor, in a corner room, and the view was amazing. You could hang a small bag on a hook outside your door when you went to bed, and wake up to yogurt, fruit, milk, and water. Tea and coffee were in the room. Breakfast was available in the restaurant downstairs- expensive! and there was a wonderful roof-top bar with a delightful view that had had great drinks and a superb dessert chocolate nacho - also expensive! I highly recommend The Hoxton and look forward to my return! Where to find Portland hotels near an airport? How can I find hotels in different Portland neighborhoods? 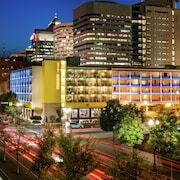 Where can I find hotels in Portland that are near tourist attractions? If you're vacationing in the Western Oregon area and you're looking to book a place to stay in Portland, you have an extensive range to choose from. Within our handy booking pages you'll find 63 apartments and hotels within 0.1 kilometres (0.06 miles) of Portland's downtown. 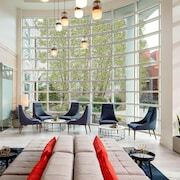 One of the keys to trouble-free travel is booking a room that's close to the action, so have a look at the The Nines, a Luxury Collection Hotel, Portland and Kimpton Riverplace Hotel, all of which are located within 1 kilometre (0.6 miles) of downtown Portland. 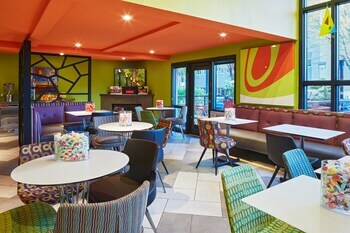 With 11 Expedia-registered hotels, Beaverton is the neighborhood with the largest selection of Portland accommodations. Beaverton is 14 kilometres (9 miles) from downtown. Beaverton accommodation options include the Homewood Suites by Hilton Hillsboro/Beaverton and Hilton Garden Inn Beaverton. 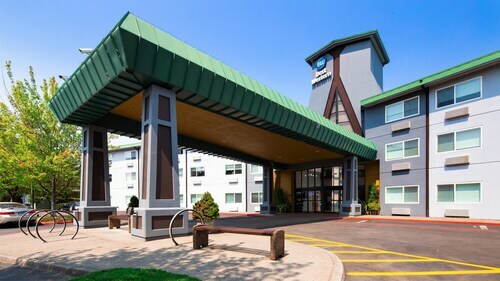 You can also find a place to stay in Clackamas, which is where you'll find the Courtyard by Marriott Portland Southeast/Clackamas and Hampton Inn Clackamas, or Forest Grove, which has the Best Western University Inn & Suites and Americas Best Value Inn Forest Grove. Hillsboro is 20 kilometres (14 miles) from Portland's downtown, while Gresham is 20 kilometres (12 miles) from the main part of Portland. The Holiday Inn Express - Hillsboro and Larkspur Landing Hillsboro - An All-Suite Hotel are located in Hillsboro, while Quality Inn and Motel 6 Gresham City Center are situated in Gresham. 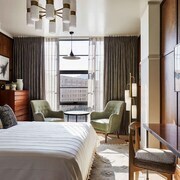 Stay near to the Portland State University by arranging a hotel room at the The Heathman Hotel or, you could also choose the Kimpton Hotel Monaco Portland. If you'd rather stay close to the Oregon Zoo, you should check out the Inn at Northrup Station or Park Lane Suites and Inn. The Grotto, another popular Portland attraction, is walking distance from the Embassy Suites Portland Airport and also the Hyatt Place Portland Airport. Hotels that are within walking distance of the Portland Japanese Garden include the The Westin Portland as well as the The Paramount Hotel. If you are flying into or out of Portland International Airport and would like to stay nearby try Sheraton Portland Airport Hotel or Aloft Portland Airport at Cascade Station. 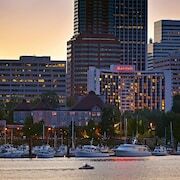 What are the most popular Portland hotels? 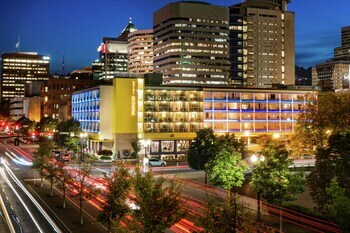 Are there hotels in other cities near Portland? What other types of accommodations are available in Portland? Explore Portland with Expedia.ca’s Travel Guides to find the best flights, cars, holiday packages and more!